I can't believe it's already been a month since I started my lip plumping adventure with PMD Kiss and I have to say that I haven't been that curious about a beauty device like I was about this one. I am definitely ready to share with you my final thoughts and show some before/after photos for yourself to decide if the device really delivers what it promises. If you just now stumbled upon this post make sure to read the initial one that offers some more insight into PMD Kiss device itself, what it is and what it claims to do. I am a busy mom of an infant which means that I don't have a whole lot of time right now to spend on my beauty routine, so I was very happy to find out that I only needed 2-3 minutes out of my day to use PMD Kiss. I've been using this device every morning by first applying the PMD Kiss Lip Plumper Serum and then using PMD Kiss in sections, for few minutes in total. I was very pleased with the whole experience which turned out to be quick, easy and totally painless. When it comes to the effectiveness of this anti-aging lip plumper, I can say that PMD Kiss delivers natural results. There is nothing drastic or well, unnatural about how it made my lips look. 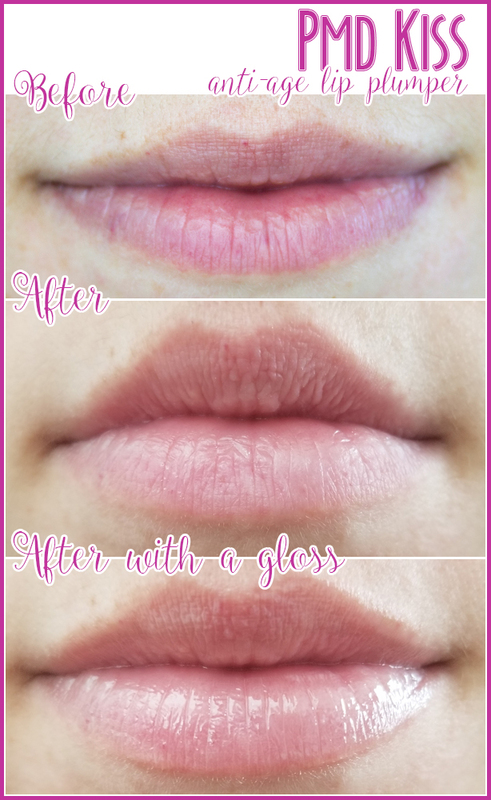 If you pay attention you can surely spot subtle changes: my lips volume improved but also did the texture and overall appearance. My lips feel softer and are more plumped and I really love the natural feel to it since surely I didn't want to end up with anything artificial. I've tried hard to use PMD Kiss every single day for the past month to take advantage of the ability of this device to increase collagen production which is a fantastic anti-age feature of PMD Kiss. Will I keep using PMD® Kiss Device? Yes, absolutely! PMD Kiss takes only a few minutes out of my day and I truly admire the natural results. Undoubtedly, PMD Kiss anti-aging features are the quality I am most excited about so I will continue to use it as often as I can!
! EXCLUSIVE DEAL ALERT ! Get 20% off your PMD Kiss device by using code PRIMP20 at the checkout! Visit pmdbeauty.com now!